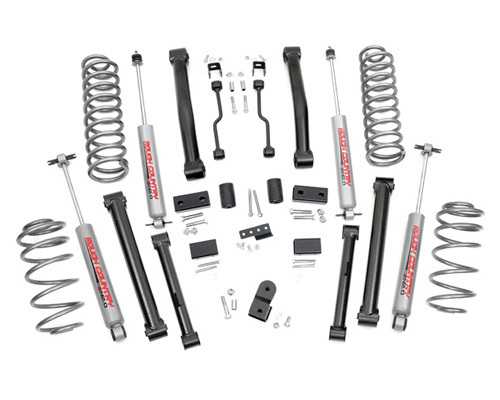 Front & rear lifted coil springs help level the vehicle and provide a mean looking 4" of boosted ride height, giving you the necessary clearance for all your off-road endeavors. Most notably, this kit offers front lower control arms & rear upper & lower control arms - a feature you won't often find on a kit like this. Utilizing all these control arms in this way eliminates drive shaft vibration and keeps your steering geometry and alignment correct. The rear upper control arms keep pinion angles at the optimum degree after lifting, thus eliminating the need for a transfer case drop, thereby providing additional clearance. Front: Lifted coil springs, lower fixed control arms, bumpstop extensions, sway-bar links, brackets & hardware. Rear: Lifted coils springs, upper and lower fixed control arms, bumpstop brackets, sway-bar brackets, brakeline relocation bracket and track bar bracket. Shocks: (4) Premium N2.0 shocks. Models equipped with CV style front driveshaft may result in driveshaft vibration. If this occurs, replacing the driveshaft, axle yoke and / or transfer case yoke will need to be performed to rid the vehicle of driveline vibration. Features application valved N2.0 series shock absorbers which offer the best in balanced performance for on and off-road use.